High-k and ALD/CVD metal precursor industry is experiencing an upswing in its growth curve with more number of players focusing on cost effective solutions. Hybrid organic and inorganic thin films are gaining popularity owing to its comparatively lower manufacturing costs and lucrative properties. Furthermore, strict regulatory measures undertaken by various governments regarding IPR protection is bringing the focus of the manufacturers on the chemical designing of semiconductors. A seamless, easy, cost effective fabrication of semiconductors require a more complexed three-dimensional structure, for which atomic layer and chemical vapor deposition process are highly adopted. In terms of regional landscape of High-k and ALD/CVD metal precursor market, Asia Pacific is one of the dominating players in the global scenario. China being the major revenue pocket for APAC market, held a 35% of the total revenue share in 2015. Driven by the growing end-use electronics product demand of the region, China High-k and ALD/CVD metal precursor industry is anticipated to continue its dominance in the regional market. As per the estimates, Taiwan holds the largest consumer base of advanced semiconductor materials, which in turn is projected to have a parallel impact on the region’s High-k and ALD/CVD metal precursor market. In this regard, another significant move in the industry was the collaboration of Chemtura Corporation with UP chemical to strengthen their LED market concentrating around Asia Pacific, by producing high purity MO precursors. Based on metal precursor technology, the market is segmented into gates, interconnect, and capacitors. Interconnect High-k and ALD/CVD metal precursor industry dominated the global demand in 2015 with an industry coverage of 45% of the total volume. With the evolution of power electronics incorporated with nonplanar transistors, nonvolatile memory chips, interconnect technology is in high demand. This segment dominated the technology landscape in 2015 accounting for 45% of the global demand. High-k gate precursor industry also had a considerable share of the global revenue in 2015 having collected a revenue of USD 33 million in 2015. Owing to some of the attributing factors that these precursors provide such as high dielectric constant, chemical and thermal stability, compatibility with gate electrode, these metal precursors are replacing silicon oxide in CMOS (complementary metal oxide semiconductor). 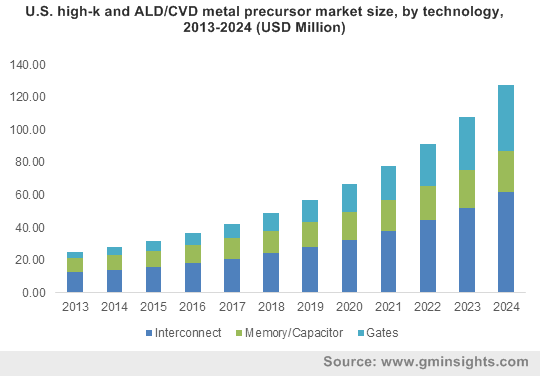 High-k and ALD/CVD metal precursor market based on gate technology are slated to witness a massive annual growth rate of 23% over the coming seven years. Europe is another region which is experiencing a significant coverage of global high-k and ALD/CVD metal precursor industry share in terms of revenue. The tremendous growth projection of the market can be credited to its wide manufacturing base of VLSI, which allows the prominence of metal precursor application in some of the memory devices including DRAMs (dynamic random access memory), CMOS, metal insulator metal diodes, ferroelectric logic etc. In addition to this, heavy investments in developing advanced wafer fabrication process will further widen its scope of applications. U.S is another region which is expected to get benefitted by this advancement in wafers processing. U.S. high-k and ALD/CVD metal precursor market having collected a revenue of more than USD 30 million in 2015, is projected to be the major revenue contributor for North America market. Mergers and acquisitions along with competitive pricing remain the major business strategies adopted by the key market players. Some of the prominent participants operating in. high-k and ALD/CVD metal precursor industry include Dow Chemical, Air Liquide, UP Chemical, and Adeka.